Hugo Demarco taught painting and design in Buenos Aires until 1957, and then traveled to Paris for the first time in 1959. There he made his first kinetic paintings, in which the optical vibration was accomplished by superimposing colors. From these early beginnings, his work centered on the study of light and movement, as well as the metamorphosis of image and color. In 1960, he founded the Groupe de Recherche d’ Art Visuel (GRAV) with Julio Le Parc, Francisco Sobrino, Horacio García-Rossi, Jean-Pierre Yvaral and Joël Stein, among others. The group promoted active public participation in art works and advocated the anonymity of the individual artist in favor of collective authorship. His first individual exhibition, which included paintings and reliefs, took place at the Galerie Denise René (Paris, 1961). 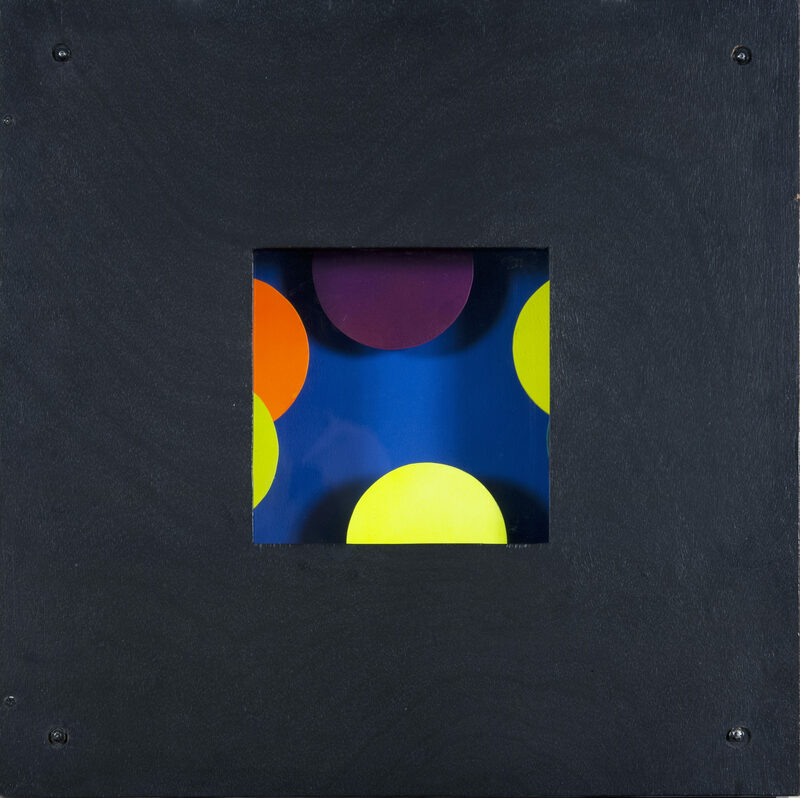 Shortly after this show, Demarco began a series of assemblages in wooden boxes, in which hidden motors activated mirrors, lights or geometric forms, modifiying their position or their relationship with the background giving rise to phenomena of optical instability. Among these works, developed in greate number during the seventies, belong Réflexion changeante, Métamorphose, Relief-transformable, Vibrations, and Arabesques. The reflection of light, one of the resources Demarco used the most, was the major element in other assemblies without motors, but rather animated by prisms. In 1963, Demarco settled down definitively in Paris with a grant from the French government. By then, he had ties with the Nouvelle Tendance movement, frequently participating in their collective exhibitions and producing two documentary films, Le mouvement (1966) and Lumière et mouvement (1967). Demarco’s painting developed in the 70s with the animation of two-dimensional surfaces becoming the main object of his research. The progressions of the form-color union, developed generally from color degradation and chromatic contrasts, created very active structures, in spite of the simplicity of their patterns. Form, color, texture and rhythm were combined to produce virtual volumes and movements, as well as great tension between the real and the unreal.